“Writing is important in the African-American tradition. We were not supposed to write and we would be severely punished or even killed if we were teaching people to read and write. One very important component of that tradition is not only naming what’s going on and maybe what needs to be changed but also what can you give people that makes them want to stand taller or, get up the next day and do what they need to do. How are you going to give people something that strengthens and sustains them? Today’s Maker Profile is here on our blog as there are a number of videos I wanted to make available to you and, because our featured artist, poet Ruth Forman, is not on Instagram. So, welcome! If you are looking to boost the levels of inspiration, beauty, light, fierce truth and courage grounded in kindness– you have come to the right place. I could quote dozens of writers and reviews that sing Ruth’s praises for her exceptional ability to make you feel the sacred in the ordinary, for the way her poems can as exquisitely capture the sweetness of youth as they can the sharp, bittersweet realities of the adult world, but since what I find most compelling in Ruth’s work is how her poems have such a personal touch that each of us find our own understanding there, I will simply encourage you to find her work and read it for yourself. What I resonate most deeply with is her ability to remind us of the power and magic that is the creative power within us and, how by nurturing creativity we actively keep faith in the future. Ruth’s first book of poetry, We are the Young Magicians, set my soul on fire in the very best of ways. It was 1993. I was studying at Bread Loaf and this slim volume cracked me open. Her voice, her words– it was like hearing a song that makes you come alive when you didn’t know part of you had been crushed nearly to a point of no more breath. Over the years, I have pulled We Are The Young Magicians from my bookshelf countless times to give away to someone I thought needed oxygen and light for their flagging spirit. The last time I went to the shelf and it wasn’t there, I ordered another copy with the strict intention not to give it away– but to direct anyone interested to find it for themselves. In this moment, I am practically sitting on my hands not to type out “You So Woman,” a poem from this first volume that I had on repeat in my head for nearly a year; it is everything good, powerful, loving and truly seeing and celebrating the radiance of Black female spirit. However, you will just have to go and read it for yourself so that I don’t in any way mess with your direct experience of it. For me, reading the work of Ruth Forman is to watch everything inside of you realign with the healing power of truth. 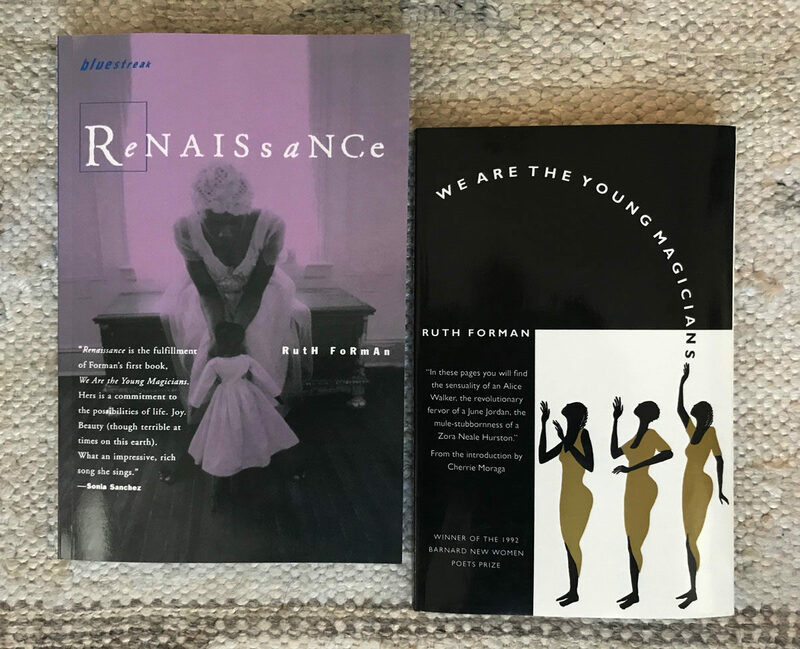 It has been 25 years since I first met Young Cornrows sitting on the brownstone steps* and Ruth has since written a children’s book entitled Young Cornrows Callin Out the Moon, and published two more volumes of poetry: Renaissance and Prayers Like Shoes. You can listen to Ruth reading from Young Cornrows Callin Out the Moon on an NPR episode HERE. And, there are more children’s books coming that Ruth is publishing with Simon & Schuster so stay tuned for those, too! We are absolutely thrilled that Ruth gave us permission to celebrate her here today and trust, for those who may not have known her work previously, that you are about to have a most wonderful new poet in your life. Ruth is the recipient of the Barnard New Women Poets Prize, The Pen Oakland Josephine Miles Literary Award, the Durfee Artist Fellowship, a DC Commission on the Arts and Humanities Artist Fellowship, the National Council of Teaches of English Notable Book Award, and recognition by The American Library Association. Ruth has presented in forums such as the United Nations, the PBS series The United States of Poetry and NPR. Ruth is a former teacher of creative writing with USC and June Jordan’s Poetry for the People program at UC Berkeley. She’s also a fourteen-year faculty member with the VONA-Voices writing program. One last share. Below is Ruth reading “May Peace Come” at the Hedgebrook/Whit Press Writers Series in Seattle, WA — April 2009.